Syracuse University Art Galleries is pleased to present our first limited edition print, The Artist’s Proof. 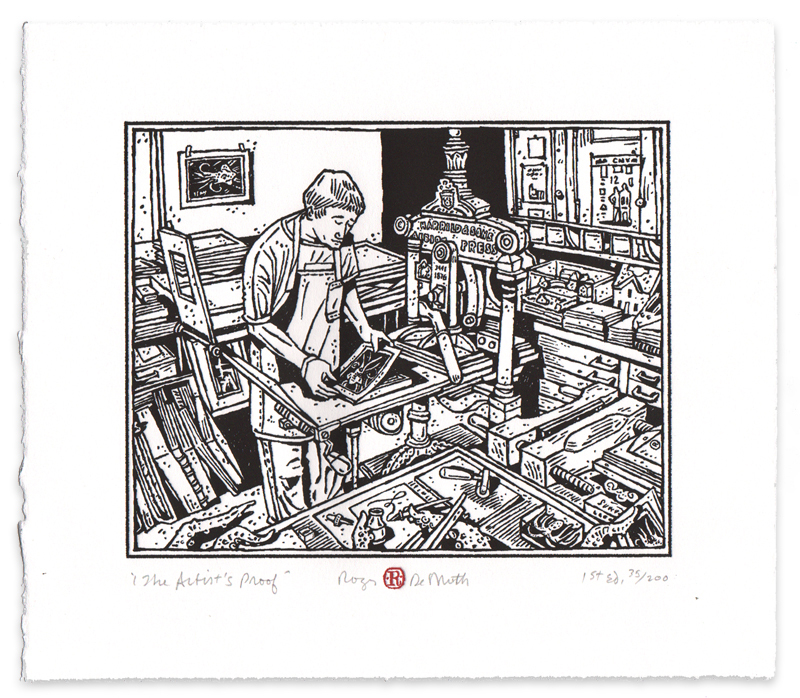 Created by acclaimed illustrator and longtime faculty member Roger De Muth, the image depicts a studio assistant working on the artist’s cherished Albion relief press in his Cazenovia, NY studio. Printed by SUArt Galleries Assistant Director Andrew Saluti in an edition of 200 impressions, this original artwork is hand signed by the artist. In 2011 we had the privilege of presenting Roger’s work alongside one of his colleagues, John Thompson, at the Louise and Bernard Palitz Gallery at Syracuse University Lubin House in New York City. Attended by hundreds of former students, alumni and friends, the exhibition included recent watercolor paintings of Roger’s travel through Italy, England and Nantucket. We were thrilled at his interest to collaborate on our inaugural print and he has set the bar very high for future projects. The Artist’s Proof is now available in our GALLERY SHOP. Limited impressions are available, order yours today. You can always support the SUArt Galleries online. Simply click the GIVE NOW button to be directed to Syracuse University’s secure giving website. Help us continue the dynamic exhibitions and engaging programs and events that enrich the Syracuse Arts community.